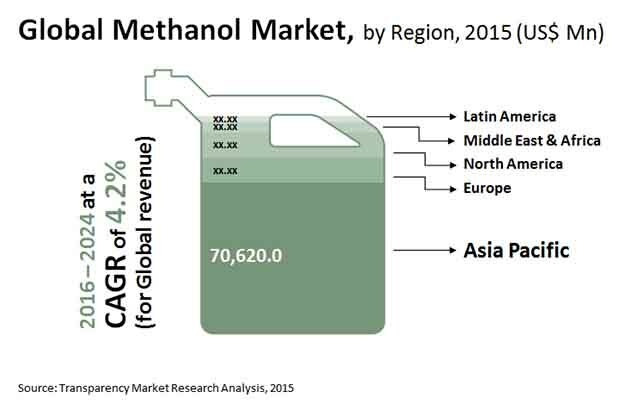 The global methanol market is consolidated in nature with a few regional companies having strong presence over the consumer base, according to a report by Transparency Market Research (TMR). The report identifies RAMA Petrochemicals Ltd., Reliance Industries Limited, Petroliam Nasional Berhad (PETRONAS), AR-RAZI Saudi Methanol Company, Gujarat Narmada Valley Fertilisers & Chemicals Ltd., and Shenhua Ningxia Coal Industry Group Co. Ltd. as some of the leading companies in the global methanol market. The TMR report notes that the methanol market is characterized by long-term contracts, strong product portfolio, and healthy company-customer relationship. Alliances and acquisitions are other strategies adopted by the key players in order to expand their regional presence. For instance, in 2015, Shenhua Ningxia Coal Industry Group Co. Ltd. acquired Zhoushan Power, Xuzhou Power, and Ningdong Power to strengthen their local presence in China. As per the TMR estimations, the global methanol market had an opportunity worth US$101.4 bn in 2015, which will increase to US$145.6 bn by 2024, expanding at a healthy CAGR of 4.2% during the forecast period of 2016 to 2024. On the basis of application, the report segments the global methanol market into formaldehyde, MTBE, gasoline, acetic acid, DME, and others. Out of these, the segment of formaldehyde accounted for 29.6% of the global demand in 2015, which was a reflection of its use in the production of adhesives and wood products such as panels. The flourishing construction sector, especially in the emerging economies, is another factor augmenting the demand for this low cost and high purity methanol market segment. However, formaldehyde segment is expected to experience a sluggish growth during the forecast period as compared to DME and gasoline. Region-wise, Asia Pacific is the most lucrative region for the players in the global market for methanol, accounting for 70.0% of the demand in 2015. Countries such as China, India, South Korea, and Japan are expected to maintain Asia Pacific’s leading position in the methanol market, owing to heavy investment by major players in those countries. Easy availability of raw materials is expected to drive the demand for methanol in the regions of Latin America and the Middle East and Africa. Factors such as rising demand for methanol from China, increasing adoption of the methanol to olefins (MTO) technology, swelling demand for petrochemicals in Asia Pacific, and the need for alternatives to conventional transportation fuels are expected to boost the growth rate of the methanol market during the forecast period. Conversely, fluctuating prices of methanol, economic slowdown, and government regulations and policies pertaining to the use of methanol are some of the factors hindering the market from attaining its full potential. The report also notes a few trends such as the booming shale gas production in North America, increasing focus of the automotive industry to reduce carbon footprints, and growing application of methanol as a marine fuel and ingredient for wastewater treatment.